Some people travel to visit museums, monuments and landscapes. I travel largely to eat. While others plot to-the-minute itineraries around churches and ruins, I focus on food blogs and restaurant opening hours. Eating is the best way to explore a new place, and in most instances that exploration starts at home. In the case of my first visit to Malaysia, it started in a variety of restaurants in Soho and then getting to know restaurateur Eddie Lim, Malaysia's most persuasive unofficial ambassador in London. "You have to go," he urged me. 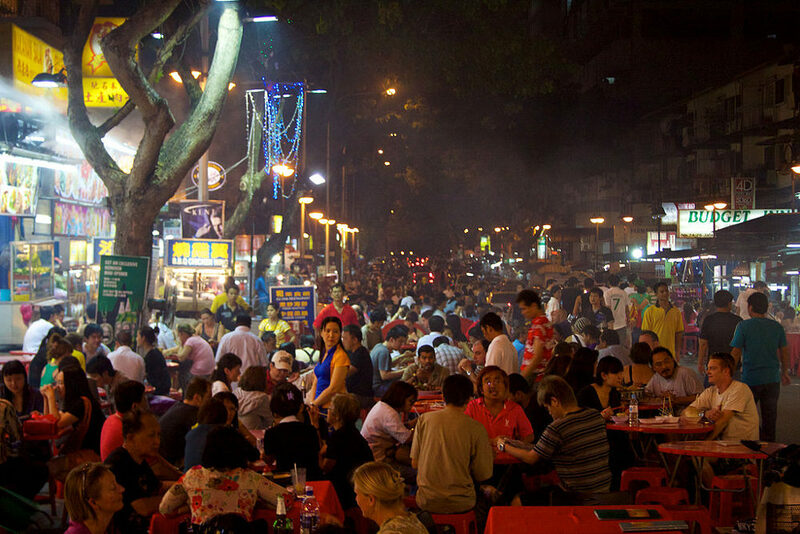 "Malaysia really represents the world's first fusion cuisine – Malay, Chinese and Indian." A month later, I was sitting on the terrace of Jumbo in Singapore, face and hands smeared with the remnants of a pot of chilli crab, gearing up for a bus trip to Kuala Lumpur. It speaks volumes that I'd made a pit stop in a neighbouring country just for dinner. I'd prepped for my trip by speaking to several foodie friends, including the New York-based Malaysian fashion designer, Zang Toi. Zang has his own restaurant in Kuala Lumpur, the Zang Toi Cafe. When I told him I was heading to his hometown, he arranged for his brother, See Luon Toi, to host a dinner for me at the cafe, with his family's speciality, Hainanese chicken. More than any other country I've ever visited, Malaysia lives its life around meal times. Locals don't ask you how you are when they meet you, they ask "Have you eaten?" The Toi family were full of recommendations: "Go to Overseas and have the duck stuffed with herbs. And the freshwater prawns." Mid-fork-full, See Luon handed his phone to me. It was Zang from New York: "You have to fly to Kelantan! For the curry!" I didn't have time to visit Kelantan. As it was, my itinerary in Kuala Lumpur was tight and I wanted to take in Malacca and Langkawi too. So much food, so little time. KL is a steaming, mall-filled, traffic-congested Asian megalopolis. It's also one of the few places in Asia where you can find a 5-star palace for around $210 a night. I wanted to stay in the midst of the skyscrapers, so checked in to the Ritz-Carlton, home to the much-loved Chinese power-lunch spot Li Yen. Next, I moved to the iconic Petronas Towers, and into the Mandarin Oriental, a hotel that covers with glamour and aplomb every dining base, including ones you never thought of (chocolate sushi anyone?). By day, the neighbouring twin structures look like a gleaming silver setpiece from Fritz Lang's Metropolis. After dark, viewed from the slick club floor of the Mandarin Oriental they sparkle like diamonds and glow like Emerald City. I spent a day touring KL with Adly Rizal, co-founder of a Malaysian food website. Adly is a street-food obsessive. We drove out to the National Palace and parked behind scores of other cars, at Jalan Istana. "Everyone's here for the same reason and everyone has their own favourite stall," said Adly, as we walked through clouds of smoke towards a row of ramshackle outdoor cafes. We ate squid and mackerel in a spicy marinade, wrapped in banana leaf. Each dish cost around $3 and the scene was quite spectacular – 60 or 70 people, from families to fashion students and businessmen, all devouring delicious barbecued and pan-fried seafood, while women in headscarves counted out the takings by the till. "Don't be misled by the humble surroundings," said Adly. "These people are millionaires." From here we went to Petaling Jaya, KL's satellite city, to eat rice and deep-fried pigeon served on banana leaves at Raju's. Here, you wash your hands at an outdoor sink and your fingers serve as cutlery. Getting rice to your mouth without a fork is, for the inexperienced, a messy business. Raju's buzzes all day, but is particularly busy for breakfast, when the locals rock up for roti canai, a flat bread served with dhal. For pudding, we went to Chelo's Appam Stall in the small, frenzied food market at Lorong Ara-Kiri 3. Appam is made from flour, fermented overnight, served plain or with coconut milk and brown sugar, which makes it taste like a peculiar creme Catalan. Despite being full, we continued on to a new shopping-mall cafe, Simply Mel's, run by a mother-and-daughter team – Mel being the mother and head chef. It was a perfect example of the renaissance Adly had spoken of: the menu is made up of Portuguese-influenced dishes, all Mel's own recipes. We sampled Mel's famed Devil's Curry – a chicken dish with horns of chilli jutting from its surface – and had a glass of jelly rose selasih with basil seeds, which tasted like liquefied Turkish delight. After a whole day of eating, I could only feast with my eyes on my tour of Jalan Alor, the evening food market in the centre of town. But it was a feast as visual and dramatic as you could imagine: disco lights wrapped around trees and tubes of neon dripping from branches down on to plastic tables groaning with chicken wings and corn on the cob. The pre-nightclub supper crowd slowly gave way to the wrecked and ravenous post-party brigade. I struggled with a durian cream puff – made with the notoriously foul-smelling spiky fruit, so fragrant that it's famously banned from public transport and cabs. After a few days of shopping and grazing, I left KL's gleaming skyline for Malacca – the oldest city in Malaysia – and the most iconic hotel in town, the Majestic. The main lobby and dining room, which serves refined Peranakan dishes, are in a beautiful colonial-era building. The tiling, ceiling fans and antique decorous furniture strike all the most evocative vintage notes, while the bedrooms have dark-wood four-posters. Here I took one of the Nyonya cookery classes, creating chicken pongteh with cane sugar, candlenut, shallots and dark soy, then strolled by the canal, past the ever-circling tourist boats, towards the historic heart of town. Unlike so many hyper-modernised Asian cities, it's easy to imagine that the old alleyways around Malacca's Jonker Street still constitute downtown, even if mega malls lurk, unseen, a few streets away. It's a gleefully weird place, mixing Chinese and Portuguese visual motifs with some unexpected Alpine qualities around the bridges. There are temples and funeral homes and markets and endless street-food options: at lunchtime, 100 or so people wait in line outside the most popular chicken rice ball vendors. In the evening, even more queue outside Capitol Satay for deliciously marinated, cubed chicken thigh, skewered on bamboo sticks. Every tourist makes a point of visiting Nancy's Kitchen, which serves a fantastic Nyonya dish of chicken on the bone in fragrant lemongrass, even if the badly lit upstairs room is unlovely compared to the vintage patina of the ground floor. If you can't get a decent table, it's still worth visiting to get a box of pineapple cakes to take away. Later, I took a wrong turn and found myself nonplussed in front of an oversized two-storey toilet bowl and cistern, the doorway to T-Bowl, the world's first toilet-themed restaurant. My hunger for kitsch is as strong as it is for the finest dining, so I ventured in for a bowl of udon in black pepper sauce with a glass of something fluorescent. Everything was served on toilet-shaped plates, on tables that house rubber ducks and toothbrushes beneath their glass surface. The seats? Unplumbed toilets. The food? Beyond belief; as if the theme might have extended to the kitchen. After the madness of Malacca I flew to Langkawi, one of Malaysia's prettiest holiday islands. This is where KL goes on honeymoon: the men in shorts and flip flops, the women in billowing black. You can see Thailand from some of the beaches, and the flavours you'll experience on your plate owe some of their lightness and sourness to its neighbour. There are grill cafes in the towns here, but Langkawi is where you come for a little more finesse for dinner. I split my time between the rustic, brightly painted Malay houses of Bon Ton and the more traditional, perfectly lavish Four Seasons. Both hotels have some of the best dining on the island. At Bon Ton's Nam restaurant, I had a superb Nyonya dining platter while a beautiful black cat – one of the hundreds from the on-site cat sanctuary – dozed on my lap. At the Four Seasons, I had a crab curry with papaya and traditional island-style steamed sea bass in whole coconut, in the most elegant of tropical dining rooms. Another night, I dined at the Gulai House at the Datai, the most remote resort on the island. Again, it was superb – a mix of Malay and Indian dishes, in a dressed-up open-air jungle setting. On my last day in Malaysia, despite every urge to stay by the tranquil adults-only infinity pool and working my way through the cocktail list, I took another cookery class – Four Seasons style. Working with pre-prepared portions laid-out as if for a television show, I made my own lunch (sort of): a chicken satay starter was cooked for me, and after I'd worked on a Gulai prawn dish with pineapple, "one we'd prepared earlier" was served up with a glass of wine. One of the monkeys I'd seen playing in the trees by the spa earlier that day could probably have passed the class, but I wasn't complaining. If only cooking worked this way at home. And if only there was a glorious beach available right after pudding. This article was written by Mark C O'Flaherty from The Independent and was legally licensed through the NewsCred publisher network.